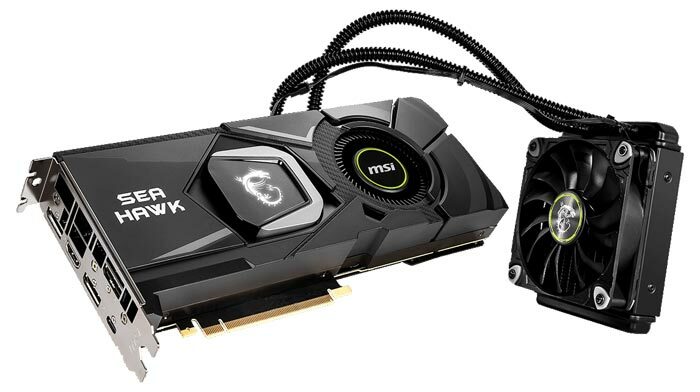 Nvidia partners continue to fill out their GeForce RTX 2080 and 2080 Ti graphics card ranges as designs are finalised and made ready for market. It looks like we are now entering a more extravagant phase of introductions, as parter 'meat and potatoes' offerings have been fully digested. 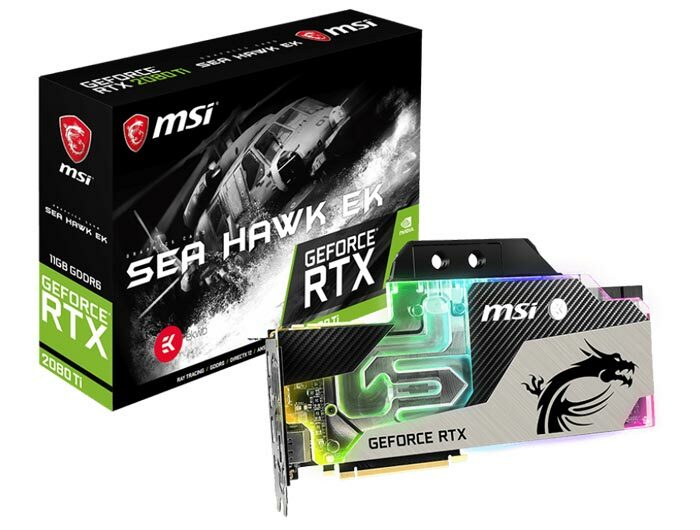 For example, a couple of days ago we saw Gigabyte tease the Aorus RTX 20 Xtreme Series, and today MSI has launched a quartet of SeaHawk graphics cards. The SeaHawk X models come with a full-coverage all-in-one closed loop liquid cooler which is based upon the Corsair H55 thermal design. As a full coverage unit it cools the GPU, via water block and radiator circulation and the memory and VRMs via an on-card fan. MSI says that the heat transfer circulation pump is efficient and its choice of wide diameter fan(s) is quiet. The GPU contact is said to be efficient thanks to the use of a micro-fin copper base. On the other side of the card is a solid metal backplate with matte black finish. The SeaHawk EK X models come with a factory fitted water block made by EK Water Blocks, as you might have expected. The water block features a central inlet split flow design, with nickel-plated base to prevent corrosion and for increased wear resistance and lasting performance. With this model you will have to integrate the card into an existing liquid cooling system in your PC. Elsewhere in the design there is a premium backplate supplied and fitted (see below), and the SeaHawk EK comes with RGB Mystic Light effects. The above quartet of liquid cooled graphics cards provide the benefit of factory overclocks. Both the RTX 2080 Ti SeaHawk X and SeaHawk X EK are 13.5 per cent faster than reference wif judged by their GPU Boost frequency of 1755MHz. Meanwhile, the RTX 2080 SeaHawk X and SeaHawk X EK series come with 8.8 per cent faster than reference GPU boost frequencies of 1860MHz. We don't have official pricing and availability for these cards as yet but you can expect to pay premiums of about US$200 for these designs.